Try out the powerful features for free with an evaluation account. Part and parcel of modern enterprise development is building APIs that enable you to expose your services to developers both inside and outside your organization. But just building APIs isn’t enough. Getting APIs and API programs to market successfully hinges on convincing your developers to actually use them. And the key driver of getting developers to adopt and consume APIs, both within a company or among the wider developer community, is the developer portal. 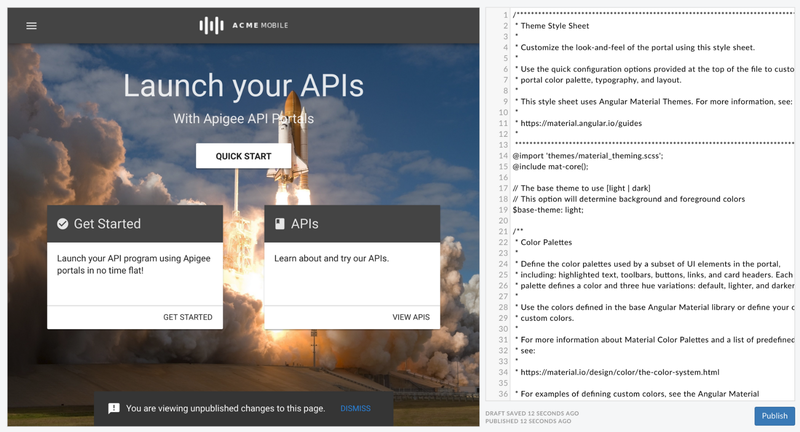 Apigee’s SmartDocs automatically creates beautiful API reference documentation for your developers, and features a new, three-pane view. The left pane helps developers navigate between areas of the API, while the center pane gives detailed documentation for a given operation. The right pane enables you to make API requests directly from the docs, and it includes an “expand” button so you can focus on the details of the request itself. Documentation is built upon on the OpenAPI Specification and supports both versions 2.0 and 3.0.x. Every operation defined in the OpenAPI spec gets its own page, which makes it easy for users to share and discuss specific areas of the docs and for your API team to deep-link users to the exact content they need. Along with SmartDocs, we’ve enhanced the default theme using Google’s Material Design toolkit. The integrated tool for creating portal themes now supports SCSS and Angular Material Themes, which introduce variables, rules, and other powerful features. Lastly, this release of the Apigee Developer Portal improves how developers create and manage accounts and gives administrators new views for managing the users of their developer portals. API providers can now view and manage all registered user accounts, and configure automatic or manual approval for new user accounts in the list of users of the API portal admin interface. This view also lets API providers see details for all registered user accounts, view custom account registration fields, and approve, block, and delete user accounts. To learn more about creating great developer experiences, read the Apigee eBook Creating World-Class Developer Experiences. If you're already an Apigee Edge cloud customer, check out our latest documentation to get started. There you'll find a complete feature overview, guided tutorials, FAQs, and more. If you're not already an Apigee Edge customer, try it for free. Apigee Edge for Private Cloud 4.19.01 Is Here!